RESOLUTION-MAKERS PACK THE gyms and streets this time of year certain this will be the year of change for them. No one is more excited about the prospect of more walks and fitness than their animal friends. Now the event is as much for the pups as it is for the humans. 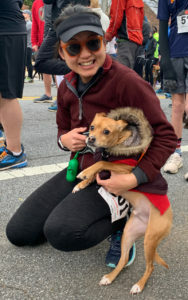 There is a one-mile puppy trot in addition to the 5k competitive race. Some locals even bring their dogs in sweaters just to watch. Since they are the beneficiaries, student-athletes share responsibility for setting up, providing cheering directional and cleaning up after the event. This year teams participating included cross country, lacrosse, soccer, football and more.